As you age, you need to eat fewer calories, stay active and make healthy food choices to control your weight. Maintaining a healthy weight helps you feel energized and active, and it lowers your risk of chronic disease. If you're overweight, you're more likely to acquire type 2 diabetes, high blood pressure, high cholesterol, heart disease, stroke, gallbladder disease, certain cancers, arthritis and breathing problems. A healthy weight is determined by height rather than age, so your normal weight shouldn't change -- whether you're 25 or 70 years of age. A variety of formulas are available to determine your ideal body weight, but keep in mind they don't factor in your activity level, muscle mass and frame size. Ideal body weight is based on your height and gender. If you're female, the Hamwi method gives you 100 pounds for 5 feet and 5 pounds for every inch of height after that measurement. Males get 106 pounds for the first 5 feet and 6 pounds for every inch after that. If you have a large frame, add 10 percent, and if you have a small frame, subtract 10 percent. Using this equation, a 5-foot, 7-inch female would have an ideal body weight of 135 pounds, plus or minus 13 pounds. Her ideal weight range would be between 122 and 148 pounds. A 6-foot, 3-inch male should have an ideal body weight of 196 pounds, plus or minus 20 pounds. His ideal weight range would be between 176 and 216 pounds. Compare your results for the Hamwi method to the actual numbers you see on the scale to determine if you are under- or overweight. Body mass index is a common measurement to determine overweight and obesity in adults. BMI is strongly associated with body fatness, except in very muscular individuals, and older adults tend to have more body fat than younger adults with the same BMI. Using the metric system, you can calculate your BMI by dividing your weight in kilograms by your height in meters squared. Using pounds and inches, you can calculate your BMI by dividing your weight by your height in inches squared and then multiplying that number by 703. For example, a 5-foot, 5-inch individual weighing 150 pounds would divide 150 by 65 inches squared and then multiply that number by 703 to determine a BMI of 24.96. Alternatively, an online calculator can figure out your BMI for you. Your BMI is then placed into a category that is the same for all body types and ages. If your BMI is below 18.5, you are underweight. If it's between 18.5 and 24.9, you are at a healthy weight, while between 25 and 29.9 is considered overweight. A BMI above 30 is classified as obese. If your weight puts you below 18.5, you need to gain weight, while a weight above 25 indicates you need to lose. The National Institute of Health offers height and weight tables to determine if your weight is within a healthy range based upon how tall you are. An individual who is 5-feet, 5-inches tall should have a weight between 114 and 149 pounds. At the same size, a weight of 150 to 179 pounds is considered overweight, and anything 180 pounds or above is obese. If you are 6 feet tall, you should have a weight between 140 and 183 pounds. A weight of 184 to 220 pounds is overweight, while anything above 220 pounds is considered obese. Weight loss is a simple balancing equation in which you take in fewer calories than you expend. A pound of fat equates to 3,500 calories, so you can either decrease the number of calories you are consuming or increase the amount of exercise you are doing. If you take in 500 calories fewer than you eat each day, you'll lose weight at a rate of roughly 1 pound per week. Eat nutrient-dense foods, or foods high in nutrients, but low in calories, such as fruits, vegetables, whole-grains and low-fat milk products, lean meats and nuts and beans. Reduce your intake of sugary drinks and desserts, fatty foods and refined grains. Be wary of portion sizes so you don't overeat, and check the Nutrition Facts Labels for the foods you eat. 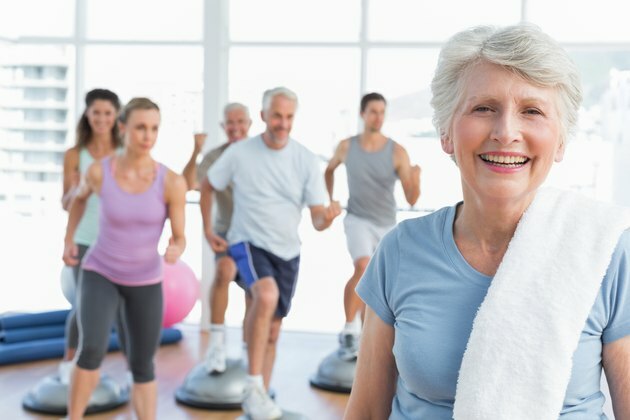 The National Institute of Health also recommends older adults partake in aerobic exercise and muscle-strengthening exercise as well to improve your balance and flexibility. Check with your doctor before starting an exercise program and gradually increase the amount of activity you are doing. Being underweight is as much of a concern in the older population as being overweight. Typically, being underweight is from not eating enough, not getting enough nutrient-rich foods, or having an illness. Consuming an extra 300 calories a day will help you gain a little over a pound every two weeks. This can be accomplished by eating a turkey sandwich and piece of fruit in addition to your daily needs. To help you gain weight, enjoy a healthy snack before bed, and drink before and after meals instead of with meals so you don't fill up on fluids. Steer clear of low-fat, or "light" foods and select the full-fat or higher calorie options. Opt for healthy fats, such as avocado, olive oil and nuts. Exercise before eating to increase your desire to eat and consider nutrient-rich energy drinks that pack a lot of nutrition into a small volume of liquid. If you have trouble chewing, swap raw vegetables with fresh fruits or 100 percent juice. Get your protein from ground meat, eggs, beans, fish and tofu. Healthy PAC-CATS: Am I at a Healthy Weight?